If you’re considering a full or partial garden makeover, you’re in the right place. A re-design of your garden is an exciting project, but there’s a huge amount to consider. So it’s best to work with a full-service landscape contractor who can help guide your vision into a sweet, welcoming reality. 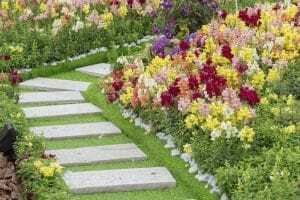 Perhaps you know what you want, perhaps you’re searching for garden makeover ideas. Wherever you’re at, we can guide and deliver. Check out some of our garden makeover designs below. Many houses in Victoria have hardly used side-yards that could be so much more. A nifty patio built from a range of materials, from slate or brick, to concrete and gravel can add a unique dimension to your home that’s perfect for relaxing and entertaining. A hidden patio can be separated by green walls or wooden partitions and filled with personal charm that will make for a wonderful place to be. Often, where the backyard meets the corner of the house you will find an air conditioner or un-kept storage space. These spaces are ideal for corner gardens that can shade certain pieces of equipment as well as your home, whilst providing a wonderful framing aesthetic. Looking out the kitchen window will be a rewarding experience when looking over the tops of blue caryopteris, fescue and a garden wall stacked with edible herbs. There are an almost unlimited array of garden habitats to consider. We’ve got a wide array of ideas throughout our site, and far too many to list on this short page. But for all that, we think it’s worth mentioning the terrace. Terraces can provide an unparalleled living space that can work just as well on flat land as they can on natural slopes. From barbeques to dinner parties, backyard fires to afternoon hangouts, a well-designed terrace is a delight to come home to. Everlast Services is uniquely placed in the Victorian landscaping market. We’re proudly Australian owned with a fantastically modern manufacturing plant located in Hoppers Crossing, Melbourne. So we can keep costs down without compromising on the highest standard of workmanship and materials. Our experience and expertise have been honed through 20 years of service in the Victorian community, but our mission has remained the same: to offer an industry-leading standard of service and products at an affordable price. Our commitment to this mission is backed by the Everlast Services Price Guarantee. For all of your garden makeover ideas: Everlast will guide and deliver. We’re affordable, reliable, Australian owned and mighty friendly.